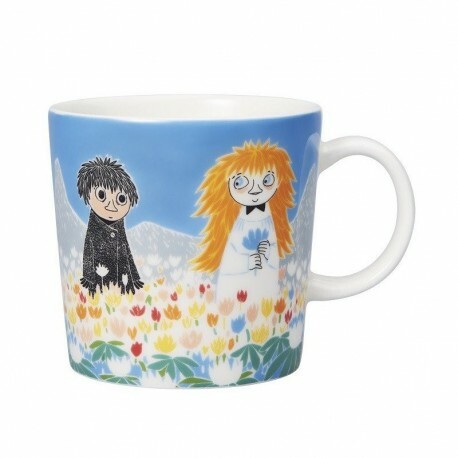 The latest addition to Moomin Friendship family is this lovely mug featuring Toffle and Miffle. All Arabia utility ware can be used in ovens and freezers. Do not take a dish straight from the oven and put it into a cold, wet surface or put it on steel. Do not put a dish straight into a hot oven from a freezer. All Arabia utility wares except dishes with gold or platinum decoration or metal parts are microwave safe. All Arabia products are dishwasher safe except dishes decorated with gold or platinum. Use a rinsing agent in the dishwasher to improve the results. Very dirty dishes can be soaked in hot water with detergent containing bleach. Cutlery made of soft steel, especially knives, may leave streaks of metal on a hard glazed surface that cannot be removed in a normal wash. (These can be removed by rubbing gently with metal polish.) Check the quality of cutlery when you buy it. To protect the glazing, avoid heavy rubbing when, for example, stacking plates. Moomin glasses are not suitable for small children, glasses may break! Moomin glasses are dishwasher safe. Serving platter with stem, cake platter with stem and Moomin figures: Handwash is recommended. The Moomins were created by Tove Jansson. She got inspired from life around her, friends and family members. Someone was full of love and joy and another was a little bit grumpy and loved solitude. All pure and beautiful such as they were. One could say that in the beginning the stories were written more for adults. Later they became children's favourites as well. Tove had an extraordinary skill to present everything in a positive way, she showed that life is beautiful as it is and we should enjoy it! With her stories Tove created a life philosophy. When buying Moomin items you buy more than just a mug or a bowl. You buy a thought and a positive attitude towards life. That is why Moomins are perfect gift both for yourself and your loved ones. Tove and Lars Jansson's original drawings have been transferred to Arabia's Moomin products thanks to Tove Slotte-Elevant. She has completed the drawings that were limited by cartoon frames, added the measurements to suit mugs, plates and bowls.